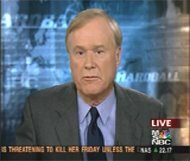 Last night on Hardball, Chris Matthews compared Michael Moore to Osama Bin Laden. Crooks and Liars has the video. Certainly, Michael Moore is no terrorist, but Osama did borrow his lines for an audio release last year. Actually, Matthews is behind the gun on this one. While Osama may have borrowed talking points from Michael Moore last year, this year it was a different story. Moore’s video depicts a seemingly shaken Bush continuing to sit in the classroom for seven agonizing minutes, even reading to the children from a book, “My Pet Goat.” The movie suggests Bush reads from the book because he is uncertain about what to do. A report this week by the federal panel investigating 9/11 confirms Bush did remain in the classroom “for another five to seven minutes.” It also offers Bush’s account: “The president felt he should project strength and calm until he could better understand what was happening,” the report states. Here are excerpts from Rep. Murtha’s famous “War in Iraq” speech on November 17, 2005 and Osama Bin Laden’s audio message released on January 19, 2006. Osama: The overwhelming majority amongst you are in favor of withdrawing the troops from Iraq. Murtha: But the war continues to intensify. Osama: The figures released by the Pentagon indicate an increase in the number of your dead and injured. Murtha: Deaths and injuries are growing, with over 2,079 confirmed American deaths. Osama: Iron is only blunted with iron. Osama: In addition to the tremendous material losses. Murtha: Our military and their families are stretched thin… Our deficit is growing out of control. The Counterterrorism Blog explains that this propaganda tactic of using current events by OBL is not an accident. One hallmark of bin Laden’s attempts to appeal to appeasement-minded Westerners has been a populist message that draws a deep divide between the common people and the bloodthirsty warmongers who are allegedly making massive profits off the U.S.’s wars. The latest audiotape not only speaks of this explicitly, but also supports the argument with a reference to the latest opinion polls on Iraq. Hopefully, this will be the last audio from the caveman. Michael Moore has a childish repsonse to the Chris Matthews attack. Ankle Biting Pundits has more on Moore.